Lion Sands River Lodge is located on the banks of the Sabie River and faces east, allowing you to watch the sun rise over the Kruger National Park, South Africa. The lodge is situated in the game-rich Sabi Sands Game Reserve. This reserve is adjacent to the well-known Kruger National Park and boasts a diverse range of African wildlife. There are no fences between the Sabi Sands Private Game Reserve and Kruger Park. Therefore, African wildlife is free to roam over both areas. The Sabi Sands Game Reserve, South Africa, is located in the Greater Kruger National Park in the Mpumalanga Province. Guests can choose to self drive from Johannesburg or fly into one of the nearby airports. Road transfers from the airport to the lodge can be arranged where needed. There are charter flights available direct from Johannesburg OR Tambo International Airport to Skukuza Airport. The estimated time of this flight is 75 minutes, followed by a short road transfer in a 4x4 safari vehicle to Lion Sands River Lodge. 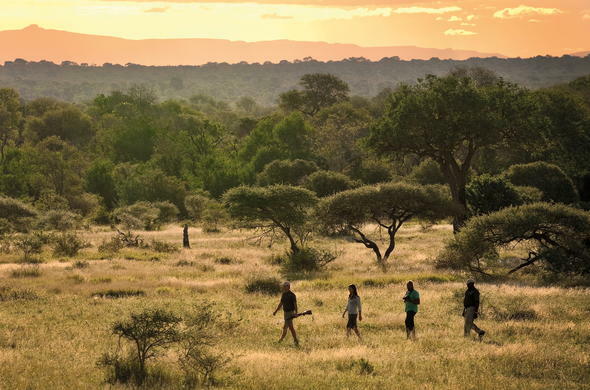 One flight daily from Johannesburg flies directly to the Sabi Sands Game Reserve (Mala Mala Airfield). Guests will be collected from the airstrip by open safari vehicles and transported to the lodge. The flight takes 1 hour and so does the road transfer. There are other airlines operating scheduled flights into Nelspruit's Kruger Mpumalanga International Airport (KMIA) from Johannesburg, Durban and Cape Town. Air and road transfers can be arranged to the Lion Sands Game Reserve. For booked road transfers from KMIA to Lion Sands, guests will be met at the airport and transferred in an air-conditioned bus. The journey takes approximately 2 hours. Guests who choose to self-drive from Johannesburg to Lion Sands can follow well maintained roads most of the way with some gravel stretches toward the end of the journey. The road trip takes about 6 hours. After about 2km (1.24 miles), turn right at the sign and follow the signs to Lion Sands River Lodge. Please note: There are entrance fees (cash only) payable for Sabi Sands Game Reserve - per vehicle and per guest. Illustrated map of the Lion Sands Reserve. Right click to zoom.